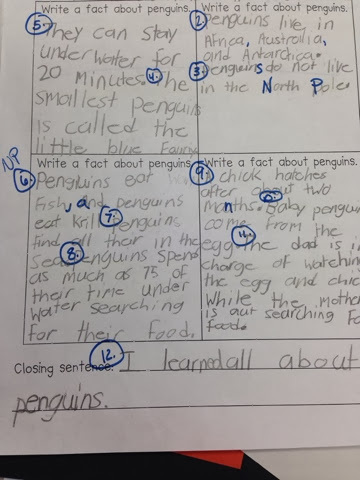 I cannot believe that I haven't taught a penguin unit before now! My kiddos love researching, and it was so much fun pulling together resources and lessons that are CCSS aligned, rigorous, and engaging. 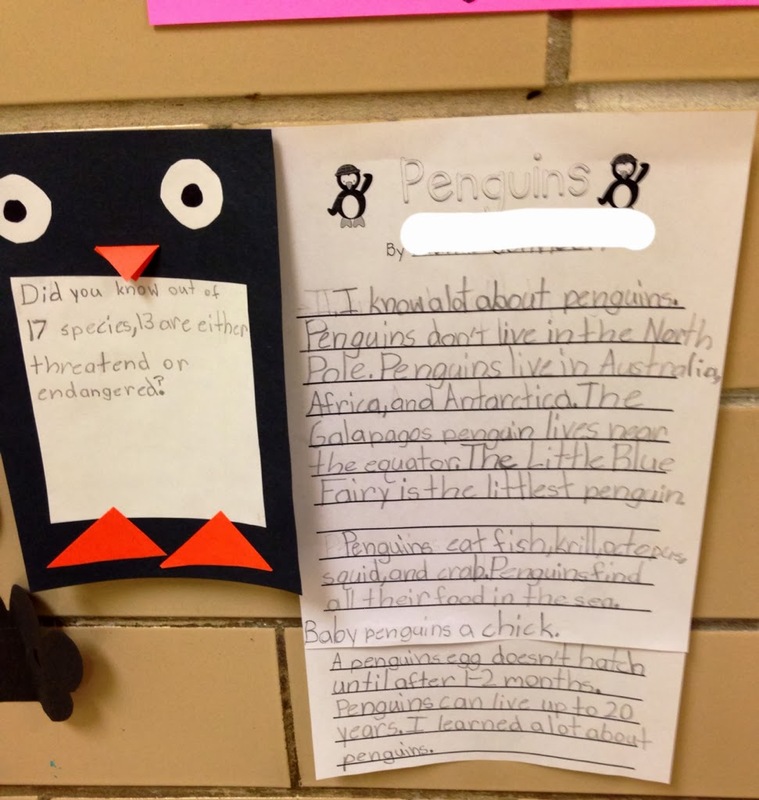 I have been DYING to blog about our penguin unit. 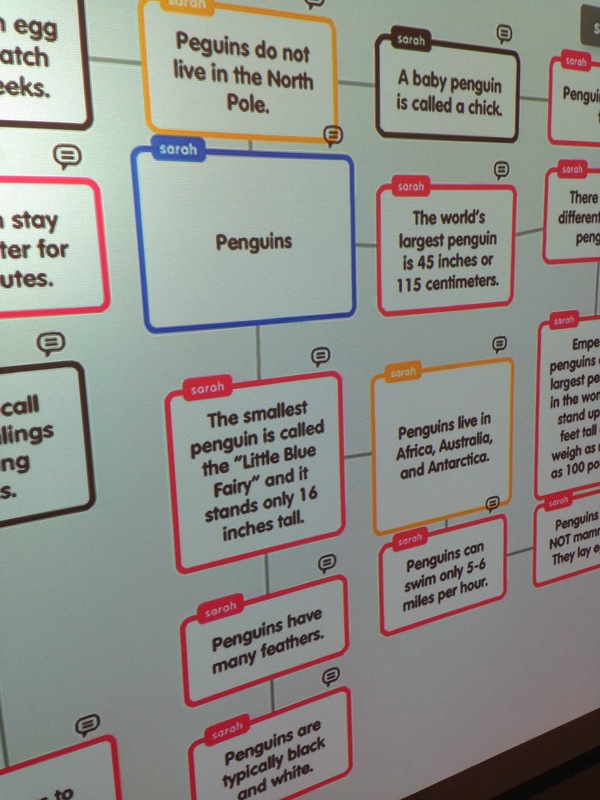 With snow days and cold delays, the last few weeks have been a little hectic, but we managed to fit in our penguin thematic unit, and I wanted to share with you how it went! 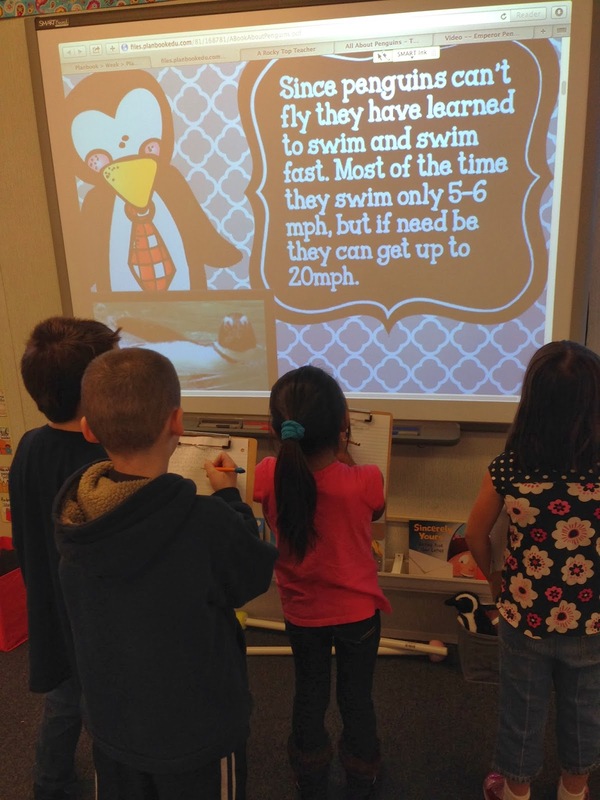 On Monday and Tuesday, we conducted our research about penguins. First, we modeled how to record information. Then, I explained their centers and set them loose! 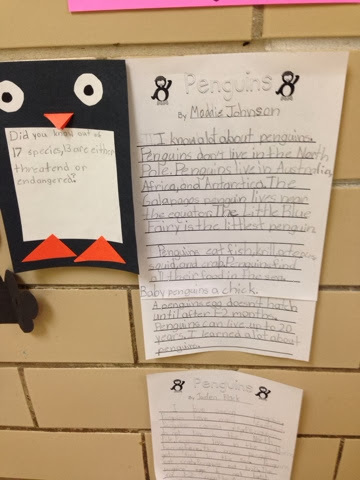 They had four centers they could rotate through in two days(nonfiction books from our library, PDF book from Hollie Griffith, fact cards from Amanda Tervoort, and a penguin ThingLink that I made). I did not tell them to record specific information. 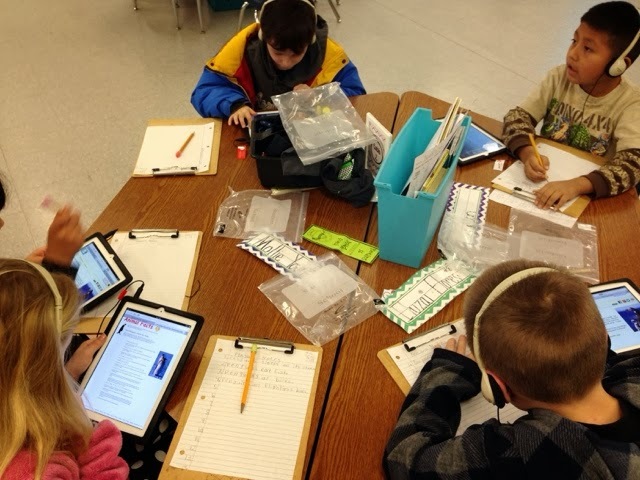 Their goal was to record 20 facts each day, and they were encouraged to record information that they found interesting. 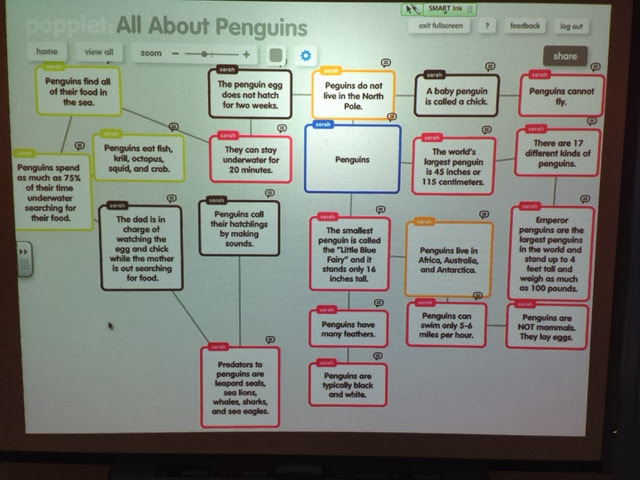 On Wednesday, we took all of the information that we had gathered and came together to create a web on Penguins using the Popplet app. I LOVE this app. Our goal was to create a brainstorming map that we could use when we started our research paragraphs. I helped the kiddos type it in this time, but look forward to them doing it on their own in the future. We put as much information as we could fit on one page. Then, we color-coded the information into categories. My favorite moment was when one student "politely" disagreed with another student's fact. "I disagree with Chris on his fact about how long it takes an egg to hatch. I found something different." This happened. No joke. So, we went back to the source and checked our information! 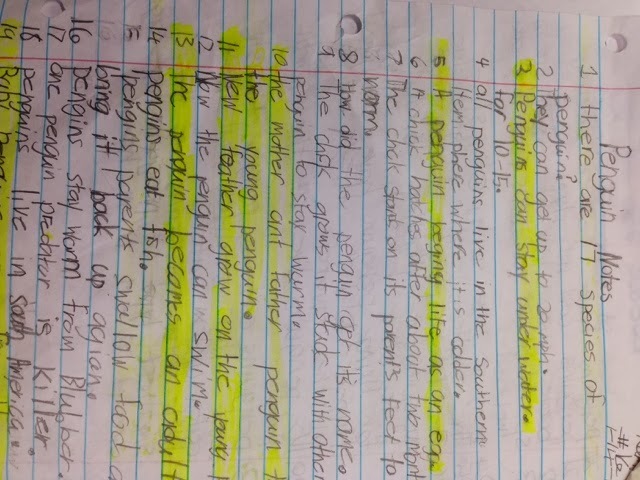 **Proud teacher moment when accountable talk that is used in math discussions shows up in other content areas. 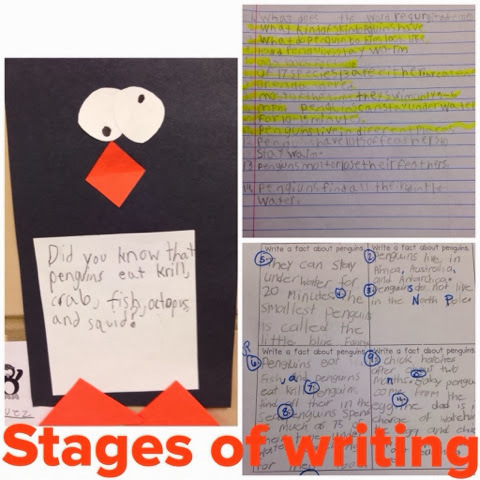 We began our writing on Thursday. I love holding writing conferences with my kids even though it takes a lot of time. My cottage teamie is REALLY good at teaching writing. I picked up a lot of the tools that I use now from her. 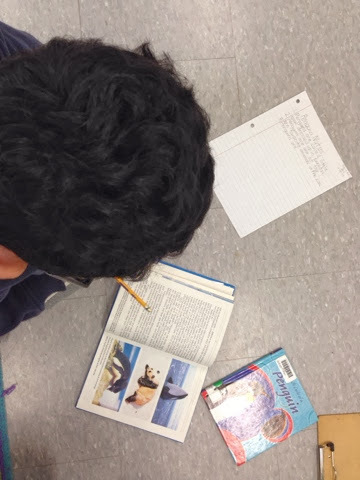 First, the students took their notes that they recorded during their research and highlighted the facts that they wanted to use in their writing, then we used a four square graphic organizer to sort the information out into categories. A special thanks to The Teacher Idea Factory for her cute penguin craft that we adapted a little. The students wrote "Did You Know?" facts on the penguin bellies! I love how they turned out!! This unit was seriously a blast! It is also a great reminder that we can still use thematic units in class that are standards driven!! It is possible!! We are getting ready to move into our 2 and 3 digit subtraction with regrouping unit. This unit can get a little complicated because regrouping is a tricky concept. I am going to be doing a lot of whole group mini lessons with major small group instruction for this unit, and I wanted to create a center that would keep my students engaged while working with my small groups. 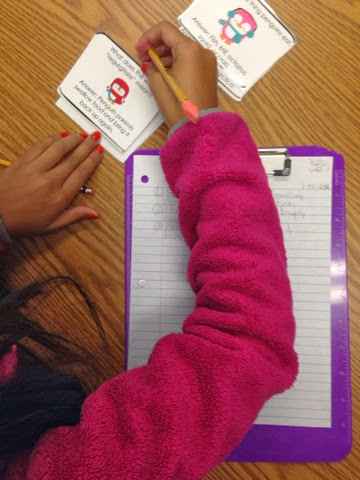 My kiddos this year LOVE QR codes. I have two little friends who beg me to make them new ones each week. So, I cooked up some QR code pages for subtraction that I can use as homework extensions and centers. Here is a sample of the product just for you. 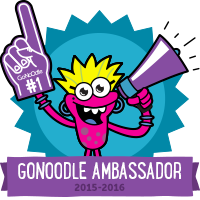 I LOVE freebies, and I am excited to share this one with you. Just click on my picture to download! If you want more options there is a product with more pages in my TPT store! Thanks for reading! Have a great school week! I'm Sarah, and I am an elementary teacher in East Tennessee. My students hold my heart, and my job is my passion. 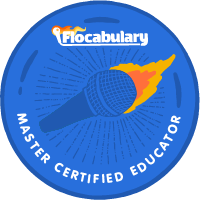 This blog is a way for me to share my teaching experiences and collaborate with my peers. Thanks for visiting! Breaking down text and a Giveaway! This blog is a personal blog written and edited by me. For questions about this blog, please contact Sarah Young( smaeyoung@gmail.com). This blog does not accept any form of cash advertising, sponsorship, or paid topic insertions. 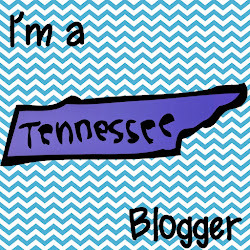 The content on this blog is solely the property of me, A Rocky Top Teacher, unless otherwise stated. Simple theme. Powered by Blogger.